In this article, we will show you how the world's leading companies in 6 industries manage and improve their supply chain through supply chain case study method. Aerospace Industry is characterized by high material costs (about 65-80%). Manufacturing systems and regulatory compliance are considered to be very complex, coupled with the limited number of suppliers due to the high barriers to entry. Moreover, the aircraft manufacturers have to do whatever it takes to win the order long before the commencement of production. There are two things Boeing and Airbus have in common, utilization of lean manufacturing systems and strategic sourcing concept. However, the overall implementation of strategic sourcing is a bit different between the two companies. Boeing wants to encourage more flight frequency and direct route using a smaller capacity aircraft. Then they decide to outsource many things such as the design, testing, and production of key components to key industrial partners and try to reduce the number of components that go to assembly. The ultimate goal is to finish the final production process within 3 days. Airbus takes a bit different marketing approach. They want to utilize high capacity airplane to help airlines drive the operating cost down. They decide to selectively outsource the production of parts and keep the design and production of key components in-house. Supply Chain of the fashion industry involves a time-based competition. Many customers have unique product needs, but competition is very fierce because of the low barriers to entry. Many new players try to offer specialized products to customers all the time. This section features the supply chain case study of H&M, Benetton, Zara, Adidas, Louis Vuitton and Marks & Spencer (M&S). H&M aims to be the price leader in the fashion market. In order to materialize its vision, H&M tries to eliminate the middlemen in various stages of the supply chain and consolidate the buying volumes. Product design is also the central part of its strategy. They don't try to follow the high fashion designs but try to adopt the street trends which are easier to produce. They don't invest in production facilities at all because they utilize a network of nearly 700 suppliers located in Asia and Europe. Also, they don't own any stores because they choose to rent the space. In order to control its supply chain, they use a central warehouse in Germany to receive and ship products to local distribution centers in different countries. At the end of the day, they can bring products to market within 2-3 weeks. Benetton, in contrast, chooses to have full control of its production, but allow its licensees to operate the stores so they can focus on production and quality control. The reason is that they would like to create worldwide brand awareness. For fast moving products, they use production facilities in Europe. Asian suppliers will perform the production of standardized products. Zara is very famous for its time-based strategy. In order to launch a new product within 15 days, Zara uses a small lot production. A new product will be tested in pilot stores. If product sales are good, a larger batch will be ordered. Otherwise, remaining products will be removed from the shelves and sold as mark-down in other stores. This creates the perception among consumers that Zara's products are unique and you have to take it while stock lasts. Vertical integration contributes to the success of Zara, they own the majority of its production facilities and stores (this is the reason why Quick Response can be effectively implemented). Its automated distribution centers are strategically located in the center of populations so products are delivered to stores quickly. Zara also works with Air France, KLM Cargo, and Emirates Air in order that they can coordinate directly with the airlines to make the outbound shipments to its stores and bring back some raw materials and semi-finished materials with return legs. Adidas copes with changing customers' demand by adopting Mass Customization strategy. The whole idea is to develop, market and deliver the product variety that most customers will find what they want. The first step towards mass customization is to strategically offer product choices. Too few variations will disappoint a customer, but too many variations will simply postpone a buying decision. After that, Adidas asks the same key suppliers to produce custom components in order to achieve the economy of scale. In order to compensate for a long waiting time, Adidas uses air freight or courier service. The reason why they can do this is that customized products are sold directly to customers so they have the highest profit margin to compensate for the higher transportation cost. Louis Vuitton is one of the largest luxury brands in the world. In the past, they supplied products to department stores. In order to create the best buying experience and control counterfeiting products, they establish their own stores in high-end shopping malls. Having own stores means they can have a better understanding of buyer behavior so they can adapt most rapidly. Marks & Spencer (M&S) is one of the biggest fashion retailers in the UK. Other than fashion items, they also sell food items and home products. FMCG industry is typically the products sold to customers at a low cost and will be completely consumed within 1 year. The nature of this industry is a shorter product lifecycle, low-profit-margin, high competition, and demand fluctuation. This section will present the supply chain case study of P&G, Unilever, Coca-Cola, and L'Oreal respectively. P&G: forecasting and new product introduction have always been the issues for many FMCG companies, P&G is no exception. To cope with this, P&G conducts merchandise testing at the pilot stores to determine the customer's response to a new product before the launch. The result is that the forecast accuracy is improved because a demand planner has an additional source of data to make a better decision. Moreover, products can be shipped to stores in-time, then lost sales are minimal. Unilever also feels that the competition in the FMCG industry has significantly increased. They have to launch the new products on a regular basis, but the forecasting for the new product is difficult. So they create a better classification of new products (base, relaunch, repack, new) using a regression model to identify potential forecast errors for each type of new product. Coca-Cola doesn't really have many stock keeping units when compared with other companies in the same industry. However, products go to over 2.4 million delivery points through over 430 distribution centers. Managing transportation at this scale is the absolute challenge. In order to streamline the delivery, Coca-Cola implemented vehicle routing software. The reason is that is the software vendor has a very good relationship with Coca-Cola's legacy ERP software vendor. Moreover, the vendor has a solid connection with the university who can help to develop the algorithm that fits in with the business' needs. The result is that transportation planners at each distribution center can use the new tool to reduce traveling time/distance on a daily basis. To expand its global footprint, Coca-Cola creates a global supply chain through a franchising model. They only produce key raw materials such as beverage bases and syrups. Then these raw materials will be sold to 300 bottling partners throughout the world. Then, franchisees in each area make the final products by adding water, sweeteners, and carbonate. Then finished products will be sold via the retailing partners. From its inception as a local company in Atlanta, Coca-Cola has now become one of the biggest multinational companies in the world, thanks to the franchising model. They also establish the R&D facilities in Chicago and Shanghai so they can understand and develop products that customers love. 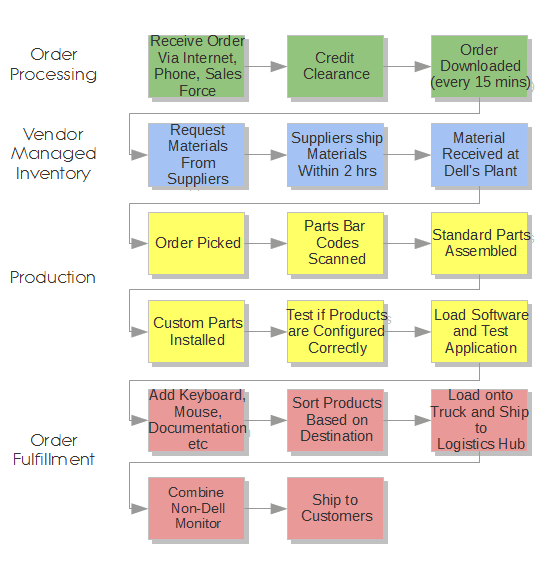 Lean manufacturing concept has been implemented widely in the automotive industry so the supply chain case study about lean manufacturing is very readily available. Due to the increasing competition in the automobile industry, car manufacturers have to launch a new model to the market more frequently. This section will show you how BMW manages long-term planning, how Ford applies the lean concept to the new product development, how Hyundai manages the production planning/control and how Volkswagen Group uses the modular design to cut cost. BMW uses a 12-year planning horizon and divides it into an annual period. After that, they will make an annual sales forecast for the whole planning horizon. After the demand is obtained, they divide sales into 8 markets and then select the appropriate production sites for each market, considering overall capacity constraints and total cost. As you may notice, this kind of long-range planning has to be done strategically. Ford calls its product development system as "work streams" which include body development, engine development, prototyping, and launch process. The cross-functional team are the experts and their roles are to identify key processes, people, the technology necessary for the development of new prototypes. Each work stream team is responsible to develop a timeline of each process. The detailed plan is usually presented on A3 sized paper. They clearly identify current issues they are faced with supporting data, drawings, and pictures. On a weekly basis, they organize a big group meeting of all work stream team to discuss the coordination issues. Hyundai deploys a centralized planning system covering both production and sales activities across the facilities and functional areas. They develop a 6-month master production plan and a weekly and a daily production schedule for each month in advance. During short-term planning (less than one month), they pay much attention to the coordination between purchasing, production, and sales. Providing long-term planning data to its suppliers help to stabilize the production of its parts makers a lot. This enables them to drive the economy of scale much better. The life cycle of technology products is getting shorter and shorter every day. Unlike FMCG, the launch of a new product in the hi-tech industry requires the investment in research and development quite extensively. Then, poor planning will result in a massive loss. This section will cover JIT and outsourcing by Apple Inc, Supply Chain Risk Management by Cisco System, Technology Roadmap by Intel, Supply Chain Network Model by HP, Mass Customization by Dell, Quality Management by Sam Sung and global supply chain strategy at Whirlpool Corporation and Haier. Apple Inc: Steve Jobs invited Tim Cook to help to improve Apple's Supply Chain in 1998. Jobs told Cook that he visited many manufacturing companies in Japan and he would like Cook to implement the JIT system for Apple. Jobs believed that Apple's supply chain was too complex then both of them reduced the number of product availability and created 4 products segment, reduced on-hand inventory and moved the assembling activities to Asia so they could focus on developing the breathtaking products that people wanted to buy. Cisco Systems would like to be the brand of customer choice so they implement a very comprehensive supply chain risk management program by applying basic risk mitigation strategies, establishing appropriate metrics, monitoring potential supply chain disruptions on 24/7 basis and activate an incident management team when the level of disruption is significant. Intel's new product development is done by the process called Technology Roadmap. Basically, it's the shared expectations among Intel, its customers, and suppliers for the future product lineup. The first step to prepare the roadmap is to identify the expectations among semiconductor companies and suppliers. Then they identify key technological requirements needed to fulfill the expectations. The final step is to propose the plan for a final meeting to discuss the feasibility of the project. Some concerning parties such as downstream firms may try to alter some aspects of the roadmap. Technology Roadmap allows Intel to share its vision to its ecosystem and to utilize new technology from its suppliers. 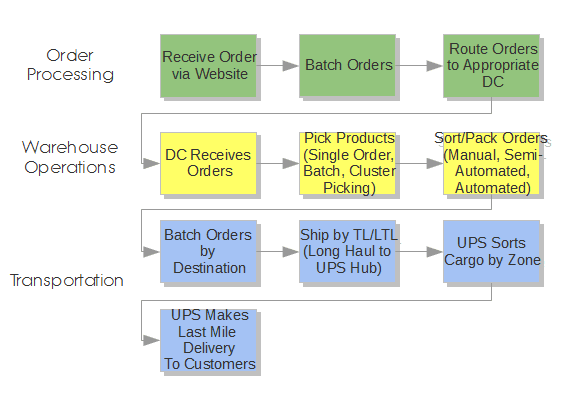 For this example, only 3 possible locations result in 5 different ways to design the supply chain. In reality, HP has more production facilities than the example above. So there are so many scenarios to work with. How should HP decide which kind of supply chain network configuration they should take to reduce costs and increase service to customers? The answer is that they use the multi-echelon inventory model to solve the problem. Sam Sung has proven to be the force to be reckoned with in the hi-tech industry. The secret behind its supply chain success is the use of the Six Sigma approach. They studied how General Electric (GE), DuPont and Honeywell implemented six sigma. After that, they have created their own implementation methodology called DMAEV (define, measure, analyze, enable, verify). They use the global level KPI to ensure that each player in the same supply chain is measured the same way. Also, they utilize the SCOR Model as the standard process. Any process changes will be reflected through an advanced planning system (APS). Whirlpool Corporation foresees that appliances such as washing machine are the standardized products. So it's essential to enter the global market so the production process can be standardized and economy of scale can be achieved. In order to implement this strategy, Whirlpool acquires a majority share in an Indian company and create 4 joint ventures in China. This kind of investment enables Whirlpools to understand the local buying behaviors through the experiences of local JV partners more rapidly. Moreover, they don't have to build a brand new supply chain everywhere they go because they can utilize the existing infrastructure that JV partners already have. The last industry covered here is the general merchandise retailing industry. The critical success factor of this industry is to understand the drivers of consumer demand. Four case studies will be presented, namely, 7-11, Tesco, Walmart, Amazon, Zappos, Carrefour, and Ikea. 7/11 is another popular supply chain case study in supply chain management. The integration of information technology between stores and their distribution centers play an important role. Since the size of the 7/11 store is pretty small, it's crucial that a store manager knows what kind of products should be displayed on shelves to maximize the revenue. This is achieved through the monitoring of sales data every morning. Sales data enables the company to create the right product mix and the new products on a regular basis. 7/11 also uses something called a combined delivery system aka cross-docking. The products are categorized by the temperature (frozen, chilled, room temperature and warm foods). Each truck route to multiple stores during the off-peak time to avoid traffic congestion and reduce the problems with loading/unloading at stores. Tesco is one of the prominent retail stores in Europe. Since the UK is relatively small when compared with the United States, centralized control of distribution operations and warehouse makes it easier to manage. They use the bigger trucks (with special compartments for multi-temperature products) and make a less frequent delivery to reduce transportation cost. Definitely, they use a computerized system and electronic data interchange to connect the stores and the central processing system. Wal-Mart's "Everyday Low Prices" is the strategy mentioned in many textbooks. The idea is to try not to make the promotions that make the demand plunges and surges aka the bullwhip effect. Wal-Mart has less than 100 distribution centers in total and each one serves a particular market. 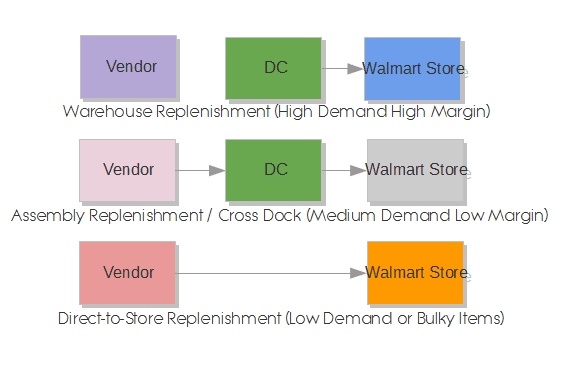 To make a decision about the new DC location, Walmart uses 2 main factors, namely, the demand in the proposed DC area and the outbound logistics cost from DC to stores. Cost of inbound logistics is not taken into account. In contrary to general belief, Wal-mart doesn't use cross-docking that often. About 20% of orders are direct-to-store (for example, dog food products). Another 80% of orders are handled by both the warehouse and cross-dock system. Wal-Mart has one of the largest private fleets in the United States. The delivery is made 50% by common carriers and 50% by the private fleet. The private fleet is used to perform the backhauls (picks up cargoes from vendors to replenish DCs + sends returned products to vendors). Short hauls (less than one working day drive) is also done by the private fleet. For long-hauls, the common carriers will be used. There are 2 main information systems deployed by Wal-Mart. "Retail Link" is the communication system developed in-house to store data, share data and help with the shipment routing assignments. Another system is called "INFOREM" for the automation of a replenishment process. INFOREM was originally developed by IBM and has been modified extensively by Wal-Mart. INFOREM uses various factors such as POS data, current stock level and so on to suggest the order quantity many times a week. Level of collaboration between Wal-Mart and vendors is different from one vendor to the other. Some vendors can participate in the VMI program but the level of information sharing is also different. VMI program at Wal-Mart is not 100% on a consignment basis. Amazon has a very grand business strategy to "offer customers low prices, convenience, and a wide selection of merchandise". Due to the lack of an actual storefront, the locations of warehouse facilities are strategically important to the company. Amazon makes a facility location decision based on the distance to demand areas and tax implications. Upon receipt of the orders, Amazon assigns the orders to an appropriate DC with the lowest outbound logistics cost. In Amazon's warehouse, there are 5 types of storage areas. Library Prime Storage is the area dedicated to book/magazine. Case Flow Prime Storage is for the products with a broken case and high demand. Pallet Prime Storage is for the products with a full case and high demand. Random Storage is for smaller items with moderate demand and Reserve Storage will be used for the low demand/irregular shaped products. Amazon uses the propitiatory warehouse management system to make the putaway decision and order picking decision. After the orders are picked and packed, Amazon ships the orders using common carriers so they can obtain the economy of scale. Orders will arrive at UPS facility near a delivery point and UPS will perform the last mile delivery to customers. Amazon is known to use Sales and Operations Planning (S&OP) to handle the sales forecast. Anyway, this must be an S&OP process at product family/category level. Zappos: to compete with other online retailers, Zappos pays much attention to the way they provide the services to customers. Instead of focusing on the call center productivity, Zappos encourages its staff to spend time on the phone with customers as long as they can so they can fully understand the customer's requirements. They also upgrade the delivery from 3 days to 1 day delivery in order to exceed customer expectation. Ikea also has its own stores for different reasons. Their unique selling points are products with good design at lower prices. To drive cost down, Ikea shifts some of their activities to customers or self-service operating model. For example, they make it easier for customers to locate products during the shopping, pick the products, checkout, bringing products back home and install the furniture. This helps Ikea to reduce operating cost a lot. Do you think this is the useful collection of supply chain case study and why? Horng, T. C. (2006). A comparative analysis of supply chain management practices by Boeing and Airbus: long-term strategic implications (Doctoral dissertation, Massachusetts Institute of Technology). Alim, M. A., & Hasan, M. R. (2010). Factors Affecting Supply Chain Management Efficiency in Cross-Border Outsourcing-A case study of H&M and it´ s Outsourcing Operations in Bangladesh. Palladino, A. P. (2010). Zara and Benetton: Comparison of two business models. Piller, F., Lindgens, E., & Steiner, F. (2012). Mass customization at Adidas: Three strategic capabilities to implement mass customization. Koenigs, L. E. (2002). A" go to market" strategy: enabling P&G profitable share growth through streamlined logistics (Doctoral dissertation, Massachusetts Institute of Technology). Vergouwen, Y. P. A., van Donselaar (KH), & de Jong (A.). (2010). How product assortment decisions affect supply chain performance within Unilever Benelux. Technische Universiteit Eindhoven. Fleischmann, B., Ferber, S., & Henrich, P. (2006). Strategic planning of BMW’s global production network. Interfaces, 36(3), 194-208. Liker, J. K., & Morgan, J. (2011). Lean product development as a system: a case study of body and stamping development at Ford. Engineering Management Journal, 23(1), 16-28. Hahn, C. K., Duplaga, E. A., & Hartley, J. L. (2000). Supply-chain synchronization: lessons from Hyundai Motor Company. Interfaces, 30(4), 32-45. Miller, P., & O'Leary, T. (2005). Managing operational flexibility in investment decisions: The case of intel. Journal of Applied Corporate Finance, 17(2), 87-93. Billington, C., Callioni, G., Crane, B., Ruark, J. D., Rapp, J. U., White, T., & Willems, S. P. (2004). Accelerating the profitability of Hewlett-Packard's supply chains. Interfaces, 34(1), 59-72. Kumar, S., & Craig, S. (2007). Dell, Inc.'s closed loop supply chain for computer assembly plants. Information Knowledge Systems Management, 6(3), 197-214. Mo Yang, H., Seok Choi, B., Jin Park, H., Soo Suh, M., & Chae, B. (2007). Supply chain management six sigma: a management innovation methodology at the Samsung Group. Supply Chain Management: An International Journal, 12(2), 88-95. Keränen, V. (2011). Supply chain management in Finnish retailing, comparison to world-class company. Case Kesko Food and Seven-Eleven Japan. Smith, D. L. (2006). The role of retailers as channel captains in retail supply chain change: the example of Tesco.